Always a good citizen, the V-Strom 1000XT Adventure has innovative systems to maintain engine performance and great fuel economy while achieving worldwide emission standards. 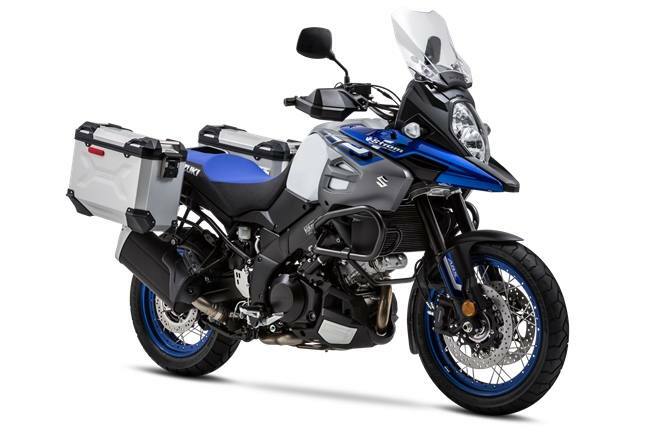 To emphasize Suzuki's adventure heritage, the V-Strom's styling hints at its lineage with a renewed call for adventure. That fresh styling also contributes to functionality and joins the unique Motion Track Anti-lock* and Combined Brake System and other features to bring rider assist technology to a new group of adventure riders. The ISC on the V-Strom 1000 has Suzuki's Low RPM Assist feature that seamlessly adjusts engine speed during takeoff and low-speed riding to smooth the power delivery and to help reduce the possibility of the rider stalling the motorcycle. The V-Strom's Anti-lock Brake System (ABS)** has Suzuki's unique Motion Track Anti-lock and Combination Brake System. This system aids rider control during sudden braking, even in corners, and will help the rider continue cornering on the originally intended line.• This advanced ABS system adjusts brake pressure during upright riding with other pressure adjustments when the motorcycle is leaning to either side, so the stopping force matches the available traction.• Information about the motorcycle's attitude is continually measured by a Bosch five-axis IMU. Sensors on the front and rear wheels continually measure speed. The wheel speed and IMU measurements, plus the amount of brake lever or pedal pressure, are calculated by the ABS control unit to instantly adjust the fluid pressure to the brake calipers as required.• Additionally, this combination system can apply rear brake pressure when the front brake pressure reaches a certain point to help stabilize the vehicle. This increases stability and maneuverability during cornering.• The rider has customary, independent control of the front and rear brakes unless a situation occurs to activate the anti-lock or combination braking features.• Thanks to the new, advanced ABS control unit, the amount of kickback from anti-lock function to the lever and pedal has been significantly reduced. Suzuki debuted its first motorcycle Traction Control System* on the 2014 V-Strom 1000, and a new-generation system is employed on the 2019 V-Strom 1000XT Adventure. 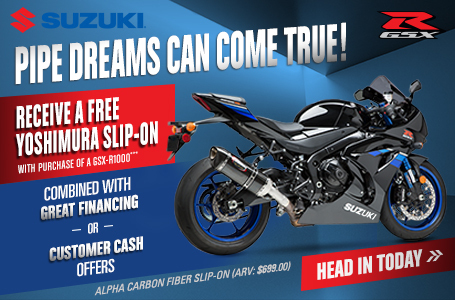 Suzuki's Traction Control System lets the rider control the throttle with more confidence in a variety of riding conditions.• The Traction Control System continuously monitors front and rear wheel speeds, throttle opening, engine speed, and transmission gear. It quickly reduces engine output when it detects wheel spin by adjusting ignition timing and air delivery.• The rider can select one of three modes (1, 2, and OFF). Modes 1 and 2 differ in terms of sensitivity. Mode 1 has lower sensitivity; it allows a certain degree of rear wheel spin for good road conditions. Mode 2 has higher sensitivity; the system engages traction control sooner and is for poor road conditions. The height- and angle-adjustable windscreen has a new shape and is 49mm taller than the prior V-Strom's screen. The windscreen was developed through extensive wind-tunnel testing to reduce wind noise and rider fatigue. Suzuki's patented mechanism allows the windscreen angle to be easily adjusted by hand. The V-Strom's slender chassis, thanks to the narrow V-twin engine design and trim seat, helps the rider's legs to reach to the ground easier than other models in the class. 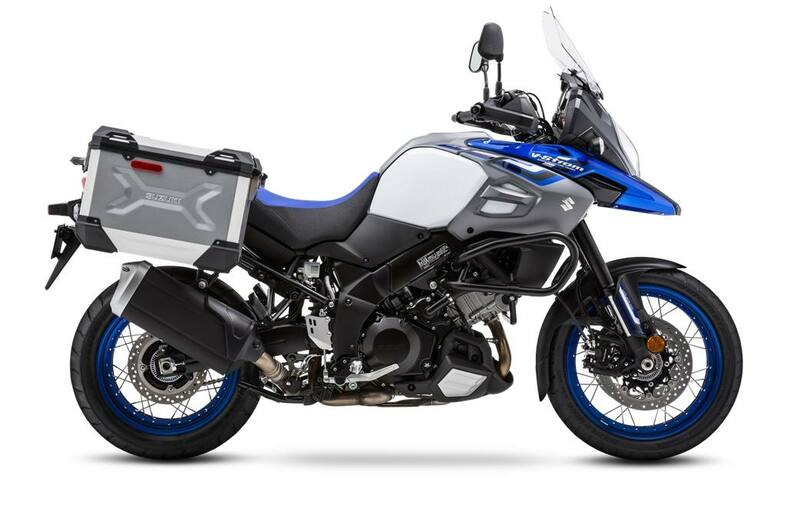 The V-Strom 1000XT Adventure is ready to tackle any road, as it is equipped with Suzuki's new, ADV-style, 37-liter aluminum panniers that attach to powder-coated, stainless steel carriers. Fashioned out of 1.5mm thick aluminum plate with super-strong, no-pierce rivet technology, these new panniers offer a number of features, including hinged lids that stay in place when open, internal and external tie-down points, plus keyed stainless steel latches and quick-release hardware. Built to be waterproof with rubber-sealing lids, these panniers have powder-coated interiors that avoid aluminum stains on cargo. New-generation Suzuki heated handgrips have multilevel heat adjustment that can be operated via the rider's thumb (without removing hands from the handlebar). Additional lock tumblers that match the bike's ignition key are included, so you can add Suzuki accessory luggage and have the convenience of one-key operation. *The traction control system is not a substitute for the rider's throttle control. It cannot prevent loss of traction due to excessive speed when the rider enters a turn and/or applies the brakes. Nor can it prevent the front wheel from losing grip.